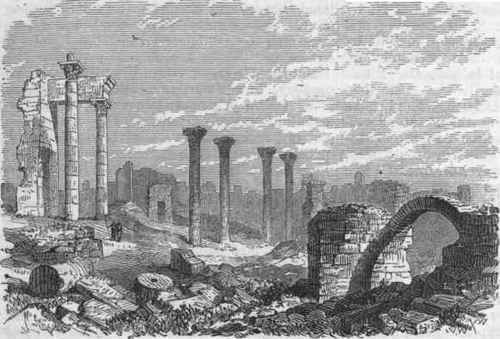 Bozrah, Or Bostra, a ruined city of Syria, in an oasis on the S. E. border of the Hauran, 76 in. S. S. E. of Damascus, in lat. 32° 30' N., Ion. 36° 24' E. It was one of the chief cities of Bashan, and is about 5 m. in circuit, with high walls 15 ft thick, and a strong castle. Among its ruins are temples, churches, mosques, baths, fountains, aqueducts, and triumphal arches. A straight street intersects the city lengthwise, and has a beautiful gate at each end; and other straight streets cross it. This city anciently contained 100,000 inhabitants; now there are scarcely 20 families. The castle stands on the S. side of the city; its outer walls and towers are still in good preservation. In the centre of this structure, supported on massive piers and arches, are the remains of a theatre 270 ft. in diameter. This fortress is supposed to have been built by the emperor Philip, who was a native of the city. - The town, which the Greeks and Romans called Bostra, is supposed by some Biblical critics, and among them Gesenius, to be identical with the Bozrah of Genesis and the prophets; but others, like Porter, distinguish between the Bozrah mentioned as a town of Edom and the Bozrah of Moab, identifying the latter with the Bostra of the ancients, and the former with Busaireh between the Dead seaandPetra; while still others contend that none of the Scriptural Bozrahs correspond to the Bostra of Bashan. This city was enlarged and embellished by the Romans, and in the reign of Trajan it was made the capital of the province of Arabia and received the name of "Nova Trajana Bostra. Under the emperor Philip it was the seat of a bishop, and afterward of an archbishop. On the invasion of the Saracens it began to fall into decay, and in the reign of Baldwin IV. of Jerusalem (1180) it was ravaged by the Turks.